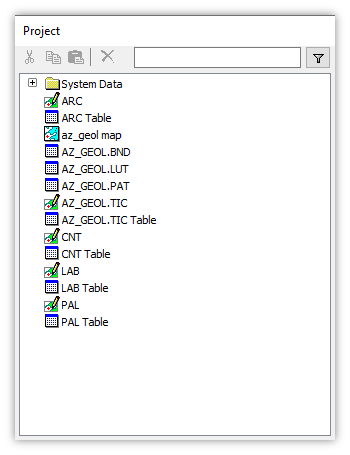 ESRI .e00 is a complex legacy format used with ESRI's ArcINFO GIS product. It is capable of storing different types of data, including images and surfaces ("grids"), but is most often used for drawings. Double-click the .e00 file desired. Tables and drawings and other components, such as labels, will be created. 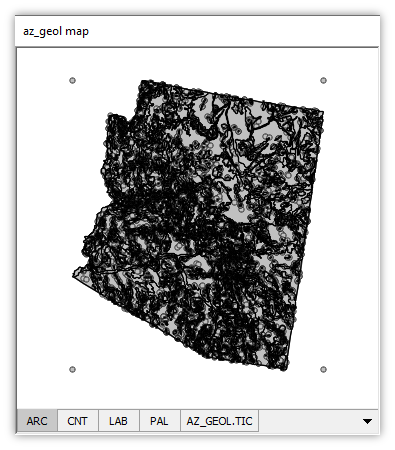 Double clicking on the az_geol.e00 file to import in the file folder shown above will result in the creation of multiple tables, drawings, and a map. 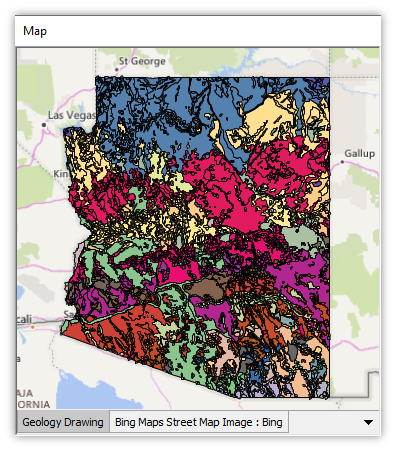 Opening the az_geol map will show a bewildering array of layers containing points, lines and areas. Further processing using the Style dialog and other Manifold facilities can produce a far more comprehensible display. 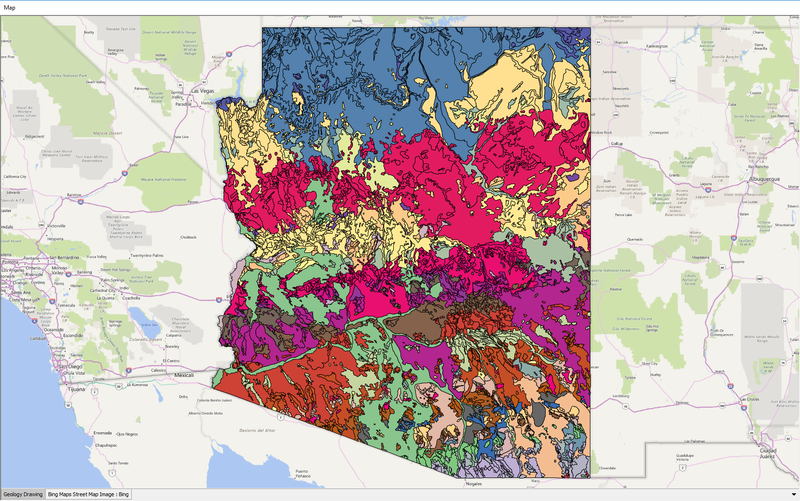 For example, the above map was created using a drawing that joined attribute information in a table imported from the .e00 with a drawing of areas imported from the .e00 and cleaned up to be more usable and then styled with a palette to show different geologic regions in different colors. The image seen above is the same map published in larger size on the Data Sources page on the Manifold website. Tinkering with legacy data imported from .e00 files can take a considerable amount of time and patience. Luckily, Manifold provides tools to extract information that is there. See the Example: Import E00 and Rearrange topic for an extensive, intricate example of how that can be done. 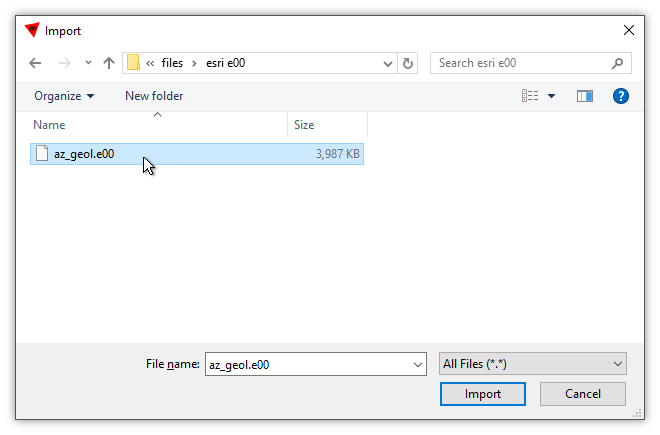 Projections - Take care to find any available commentaries or metadata information that may accompany the E00 files in use. E00 files will usually import with correct projection information. However, if they do not (as some old E00 files may not), we will have to use whatever documentation we can find on the data set to learn what the correct projection should be so we can launch Assign Initial Coordinate System in the Contents pane to specify the correct initial projection.